To keep growing on our spiritual path, we must continually do the things that sustain us. Nothing lives without nourishment. If we do not take the time to nourish our soul, we begin to wither like a neglected flower. 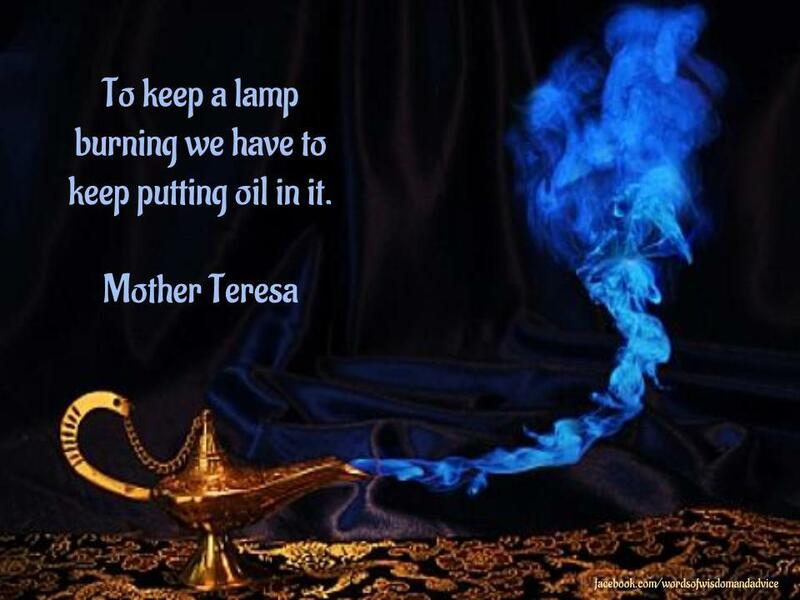 Mother Teresa once said, "To keep a lamp burning we have to keep putting oil in it." If we don't take the time to fuel ourselves on all levels, we burn out like the lamp without oil. We no longer give light. 1. Morning meditation. As soon as I awaken each day, I open the blinds, let in the light, and sit in the Lotus position to meditate. Sometimes I listen to soft music; other times I listen to the rain, or nothing at all. I also burn a stick of sandalwood incense to cleanse and purify my sacred space. 2. Enjoy a cup of freshly brewed Oolong tea. There's something sacred about the first sip of tea after a night of rest. Sipping my tea becomes a meditation in itself. I embrace the warmth of the cup in my hands. I breathe in the delicate aroma. I watch the steam swirl into the air. It's divinity in a cup. 3. Sit on my patio where I listen to a fountain of flowing water, surrounded by various plants that I inspect and care for each morning. I watch hummingbirds zip back and forth to the feeder. I listen to bees buzz from flower to flower. 4. Read uplifting passages. I am a collector of inspirational quotes. Words excite me. They pump me up when I need motivation. I also recite affirmations at various points during the day. 5. Go for a run or walk in nature. When I spend time in nature, I hold the hand of God. 6. I write. Words are my passion. I journal about and analyze my dreams. I blog about living the spiritual life. I create various posts for my Facebook page (https://www.facebook.com/wordsofwisdomandadvice) to encourage and inspire others on the spiritual path. 7. Give gratitude. I give thanks for what I have in my life. I treat my belongings with respect. The more I give gratitude, the more I am blessed in return. If I find myself feeling down, I start giving thanks and remind myself of all the good in my life. Nourishing the soul is an act of self-love. It is not selfish in any way. Without nourishment, we grow spiritually anemic. What are some of the ways in which you nourish your soul? Your comments are always welcome. Immersing myself in music, spending time with nature, reading and writing - all of them put me in a meditative trance, though I do not specifically aim to meditate. And the refreshed feeling you get is unbelievable. All wonderful activities, Suresh! Those things are of a high vibration and when we align ourselves with their energy, they lift us even higher. Thank you! Giving gratitude is the best food for soul for me! It sure is, Mina...it sure is. Thank you. Being thankful helps my soul immensely although time alone does the trick too. Loved your post and reading about how your nourish your soul and find your center. True, Kathy, solitude is a natural healer that allows us to find our centers. Thank you for stopping by and commenting. Blessings! PhenoMenon, those are wonderful centering activities. Like you, I find beauty and balance in reading, traveling, and photographing things from unusual perspectives. Thanks for stopping by and commenting. Blessings to you! Awesome, I'm with you on every single point. And to your list I add devotional and instrumental music. This post gladdened my soul. Indeed, Suzy, listening to music, moving to it, and singing to it is a wonderful way to nourish the self. I'm glad this lifted your soul. Blessings to you. I pray with my rosery ......I meditate ......and be grateful for what I have ..........I do this before everyone is up in the morning.......listening to my guardian angel......its magical.......and works. Hi, Penny! I'm enjoying your blog. This post was especially interesting to me. I'm always in search of a way to start the day with joy, and you've given me inspiration for change. Judy, hi!!!!! I'm happy this resonated with you. There's no better way to start the day with anything other than joy; it sets the tone for the entire day. I'm glad I was able to inspire you with my words. Thank you so much for stopping by and commenting. Hope to see y'all again real soon! That's a beautiful thing, Anonymous :) It is magical for sure. All beautiful things, Aditi! I'm getting ready to watch a sunrise at this moment before I head out for a run. Blessings to you! Thanks for taking the time to stop by, read, and comment. Much appreciated. Thanks, "Me." If we don't fuel our tanks, we run out of energy on every level. Thanks for stopping by. Thanks, Holly. I think gratitude fits on any list that helps us to grow into our authentic selves. I appreciate you stopping by.